The coming of the Rock Island Railroad in 1852 changed the settlement of the Township considerably. Previously farmers could do "cash crop" farming by hauling the products to the I & M Canal or by wagon all the way to larger cities like Chicago. The presence of the railroad brought distant markets to the farmer. 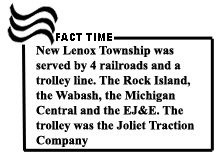 Eventually New Lenox Township was served by three additional railroads: the Wabash, the Michigan Central, and the Elgin, Joliet and Eastern. and now serves the Metra system. The area to the east of Gougar Crossing presented a more promising area along the railroad tracks to build a town and thus the town of New Lenox began. The village was platted in 1858. The town was laid out between Cedar Road on the east and the campgrounds on the west, between Walnut [Haven] Avenue on the south and Hickory Creek on the north. Although the name Tracy was the name listed on the original plat to honor the general superintendent of the Rock Island Railroad, Tracy requested that another name be found. Earlier the first supervisor for New Lenox Township J. Van Duser had named the Township New Lenox from the town of Lenox, New York, which was Van Duser's home town. 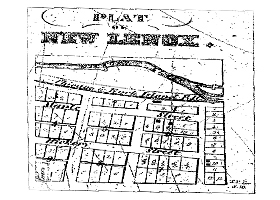 In 1863 the name for the new settlement officially became New Lenox after the Township. Religion came early to the area. Before permanent settlement began, the Methodist circuit rider visited the Native Americans. Later he began holding services in cabins and barns. This continued until a church was built in 1853. This first church known as the 1853 Bethel Church was on the border between New Lenox and Frankfort Townships to serve both areas. 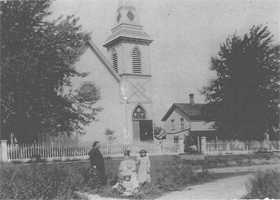 By 1863 the congregation was large enough to have separate churches so the church was dismantled and parts used to build the first Methodist Church in New Lenox on Hickory St. east of Pine St. in 1863. In the 1870s the town had three stores, three blacksmiths, a grain warehouse, two wagon shops, one hotel, a tin shop and a physician. Other services were provided from homes. 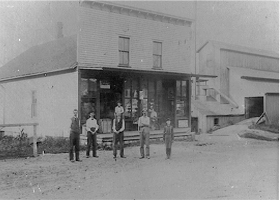 The general stores were operated by M. Knickerbocker, Tunis Lynk, and George Hilton. J. B. Saulsbury's butter factory processed up to 5000 pounds of milk daily. 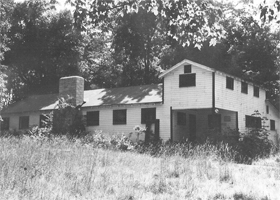 The first residence was built by Mr. Robinson. The principal business of the town remained agriculture. The Grace Episcopal Church was organized in 1868 (meeting in the Methodist Church) and began holding services in its new facility at the corner of Pine and Hickory in 1870.
the Grace Episcopal Church built in 1880 and Dickinson's Store and Grain Elevator ca. 1880. 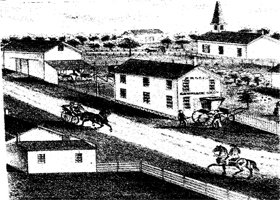 Before and during the Civil War (1861-1865) the Underground Railroad which helped slaves escape to Canada operated in Will County, including New Lenox Township. Dwight Haven on his farm in the eastern part of Will County received escapees from areas to the west, hid them and passed them on to areas to the east. Other probable locations where escaping slaves were hid may have been the Abel/Bliss farm [Gougar Rd. at Haven Av.] and the Haines farm [Cedar Rd. at Hickory Creek]. Although slaves were transported hidden in wagons, it is also believed that they traveled along Hickory Creek. 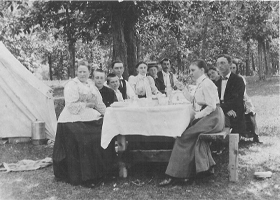 1898 Campers enjoy a lunch. After the Civil War the campgrounds on the western edge of town were purchased by Methodists and renamed the Centenary Campgrounds. In 1868 the first camp meeting was held. During these summer camp meetings people came from surrounding communities to hear the preachers and participate in the hymn sings and other events. Some came on a daily basis, other camped out in tents. Later a dining hall, bath house, tabernacle (1876), which provided a speaking platform from its porch, some cabins and other buildings were erected. The camp meetings were held for over 40 years. At first people came on horseback, in wagons or by train. Later the trolley and the automobile brought worshipers. 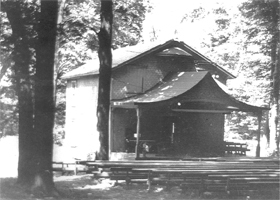 The Tabernacle served as a speaker's platform and the dining hall of the Centenary Campgrounds. Also after the Civil War New Lenox began to draw new residents from Europe, especially England. Herbert and Sydney Batson were the first of many brothers and sisters who immigrated from England. Also from the same town came Archie Corp and his family. The Grange Hall was built in 1876. The grange was a national, quasi-political group which promoted farmers' interests. The most prominent citizen of New Lenox at the turn of the century was H. N. Higginbotham. Although Mr. Higginbotham's home was located in New Lenox, he was more important and famous in Chicago where he was a partner in Marshall Field's, a banker, and the organizing and supervising force behind the World's Columbian Exposition of 1893. He was a colleague and friend of most of Chicago's leaders, including George Pullman, Marshall Field, and the Palmers. Growth for the village of New Lenox remained slow, but steady. 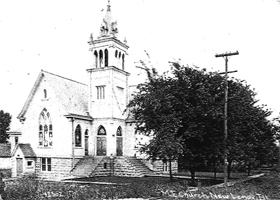 By 1899 the Methodists relocated to a larger church at Church and Haven and tore down the old church. The new church was the first building to have gas lights. The old dance hall which was in the straight path of Maple Street [U. S. 30] to the east was moved to the southeast corner of Cedar and Maple. (In the 1940s it was converted to a bowling alley.) The advent of the automobile in the early 1900s made it evident that gravel roads would be needed. A gravel pit began operation north of Hickory Creek and west of Vine St. Citizens could work in the gravel pit in order to pay poll taxes (a fee to vote.) In 1907 the trolley began operation between Joliet and Chicago Heights. By 1923 the trolley had ceased to operate because of competition from the automobile. dirt roads into graveled streets. The automobile was rapidly adopted by the people of New Lenox. Businesses changed as a result of this development. Blacksmiths shops and other businesses which served the "horse trade" either closed or converted to other uses. Many corners, especially along U. S. 30, became locations for service stations and/or mechanics shops. 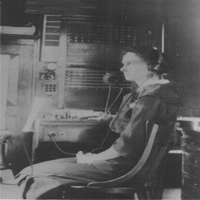 The repairman kept the telephones operating and Mrs. Deadmore manned the switchboard connecting customers. 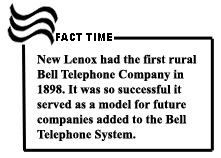 In 1898 the first rural Bell telephone company in Illinois set up business in New Lenox. By 1905 there were 132 subscribers. The switchboard was located in homes so that 24 hour service could be given to customers to handle emergencies. The Deadmore home at 221 Haven Avenue was the first location for the switchboard. 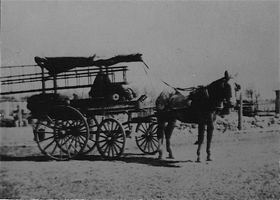 Rural mail service also began in 1902. Mail was delivered on horseback at first. Gradually the town expanded. The New Lenox Lumber & Hardware, built north of Hickory Creek on Cedar Road in 1927 opened the area north of Hickory Creek to residences in the Brookwood subdivision. Adjacent to the lumberyard a gas station and grocery store were also constructed along Cedar Road by the mid-1930s. A new bridge built over Hickory Creek on Cedar Road also assisted this development in 1933. In 1927 the New Lenox State Bank, the first bank, opened on Maple Street [U.S. 30] in the heart of town. The bank prided itself on the security of the facility because bank robberies were common at that time. At this time many people in the community began to work in other communities thus making the first New Lenox commuters. The 1930s brought economic hardships to New Lenox as it did to all of the United States. Many of the cabins in the campgrounds were converted to year-round housing. Some chicken coops and other farm buildings were similarly changed to accommodate those in need. In 1936 the Ladies Club organized the first town library. For a small fee residents could obtain a borrower's card. Archie Corp's grocery store was also the post office for a time. 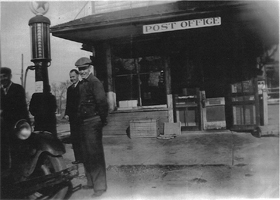 The post office moved around town, usually located in stores. Prior to the post office coming under Civil Service Administration, it was a political appointment. In what store the post office was located depended in part on the political affiliation of the store owner, the person appointed postmaster. Finally in the 1960s the first building solely for postal use was built on Cedar Road at Hickory St.
Church Street awaiting new owners. In 1946 the Village was incorporated. 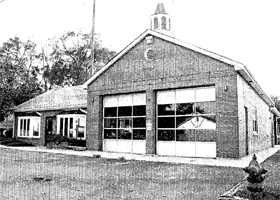 The Fire Prevention District was founded. An army surplus fire truck was added to the first fire truck so that fighting fires did not depend upon whether a train was across the Cedar Road tracks. Volunteers continued to run the fire department. Because water service was not added until the 1970s tankers had to carry water to the fires. 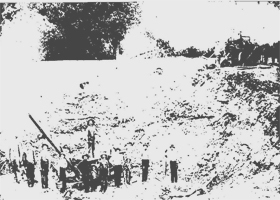 Sewer service was begun in the 1960s. All these developments as well as the post-war baby boom produced a population expansion. The village has continued its growth, doubling in size each last four decades of the 20th Century. The growth brought about a great change in education. The Haven School built in 1927(replacing the two-story wooden structure at Oak and Hickory) was unable to cope with the growth in student population and schools were built to accommodate the rise in school population: Oakview (later named Oster-Oakview)1949, Haines 1964, Bentley 1973, Tyler 1979, Martino 1995, Cherry Hill 1998 (replacing the earlier Cherry Hill), Nelson Prairie 1999, Nelson Ridge 1999, Liberty 2002. Along with this school consolidation took place closing the "country" schools which had existed from the earliest times: Marley, Lynk, Gougar, Reiter, Spencer, Schmuhl, and Francis. Students received their high school education at Joliet Township High School until Lincoln-Way High School opened in 1954. In addition St. Jude Catholic Church which was founded in 1934 opened a school in 1950. Providence High School (Catholic) opened in 1962. The first supermarket opened in the 1954 in the Lincoln-Way Shopping Center on the west edge of town, also a first. The first discount store Braun Sales open in the the same shopping plaza in 1956. This development was the forerunner of a trend that spelled the end of the corner grocery store and the introduction of chains and franchise operations. The Interstate 80 section through New Lenox was completed in 1968. 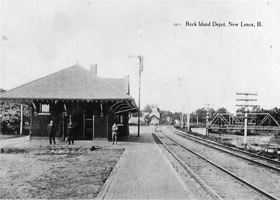 Later the Rock Island Railroad passenger service was reorganized under Metra to handle the growing commuter traffic to Chicago. Thus New Lenox became more accessible to a wider area.